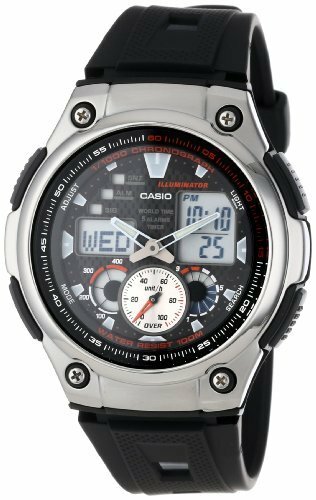 With a new, thinner profile, the Casio Men's Multi-Task Gear Sports Watch brings you a range of information in multiple formats. Accented with screw details in the corners, the contoured stainless steel case frames a round, black dial with an outside minute track, luminous hand and hour markers, and three sub-dials at the bottom of the dial. Featuring five alarms, a countdown timer, 29 time zones, stopwatch, 12- and 24-hour formats, and a velocity indicator, this high-performance timepiece is water resistant to 330 feet (100 meters). An LED light makes it easy to read in any light conditions, and this sleek watch secures to the wrist with a durable, black resin band with cut-out details. You'll love the feel of this slim watch, which adds comfort and style to its superior functionality.